Everyone has an opinion on organised tours. Some people love them, some people hate them. But in Dubai, you’re probably going to end up on one – at the top of most visitors’ bucket lists is a desert safari, which is something you would usually experience through a tour company (unless you happen to have a friend who owns a 4×4 and/or a camel). So we’ve rounded up some of the best – from the classic desert safari to cultural walking tours to foodie trails, these are the tours we’d recommend to visitors. When we have visitors in town who want to experience the Dubai desert, we always point them in the direction of Arabian Adventures. This tour company is part of the Emirates Group, so you know it’s legit. The all-inclusive Sundowner Dune Dinner Safari is our top pick – you’re picked up from your hotel by a friendly guide, and taken out to the pristine Dubai Desert Conservation Reserve, where you enjoy a falcon display, dune bashing, the desert sunset, an Arabic buffet, a quick camel ride, henna hand painting, and a belly dancing performance. They’ve got it all down to a fine art – although this is a very popular safari, it never feels overcrowded or rushed. Plus, when they say unlimited food and drinks, they really do mean unlimited. Arabian Adventures Sundowner Dune Dinner Safari, from Dhs395 (shared vehicle). Available daily, year-round. More info on website. Want to experience the desert in serious style? Platinum Heritage is a favourite of celebrities stopping over in Dubai – the likes of Zac Efron, Selena Gomez, and Joe Jonas have all been guests of this luxury tour company. What makes their desert safaris extra special is that you’re driven around in a vintage 1950s Land Rover (you’re also given your very own keffiyeh scarf to wear for bonus Instagram points). After a drive through the Dubai Desert Conservation Reserve, you’ll enjoy a sunset falcon show, before settling in for an Arabic dinner under the stars at the Bedouin camp. There’s also henna tattoos, cultural Emirati performances, and camel rides. It’s a bit of a splurge compared to some of the other safaris, but if you want to feel like a true VIP, this is the one to book. 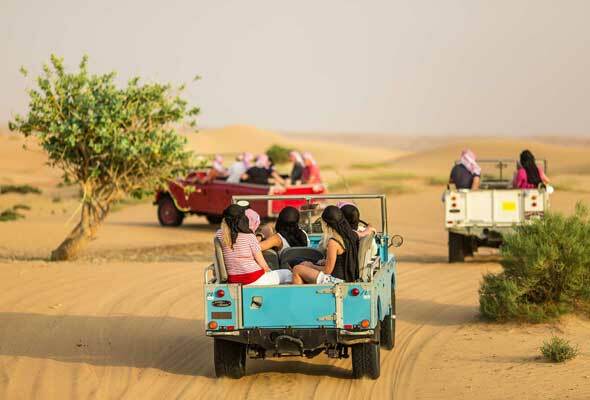 Platinum Heritage Desert Safari, from Dhs595 (Dhs495 children). Available daily, year-round. More info on website. In 2016, Nada Badran quit her desk job to start her own tour company. She offers walking tours around lesser-known parts of Dubai, with the aim of showing her guests a different side to the city. When we joined her on a four-hour walking tour, she gave us a fascinating UAE history lesson, offered tips for finding the best treasures at the bustling gold, spice and textile souks, and took us for delicious kebabs at one of the city’s oldest restaurants. Nada is an engaging tour guide who is happy to answer all of your questions – and will keep in touch throughout your stay in Dubai to offer her recommendations, so it’s like you have a local friend. She even has her own travel series on CNN Arabic, so you know you’re in good hands. Wander With Nada Old Dubai Cultural Tour, Dhs376 (children 11 and below free). Available most days of the week. More info on website. 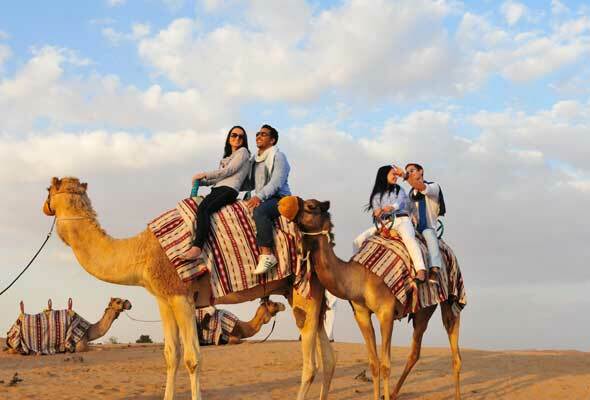 This is a tour that everyone in Dubai – visitor or resident – should do at least once. Frying Pan Adventures is the brainchild of local foodie Arva Ahmed, who knows quite literally everything there is to know about Old Dubai’s rich and varied eating scene. The company offers several different tours, but a good place to start is the Middle Eastern Food Pilgrimage. 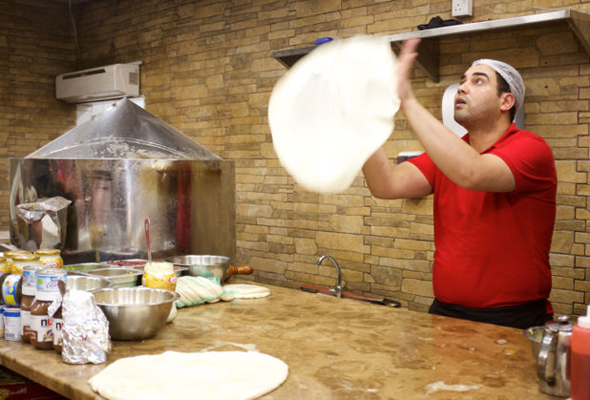 Over four hours, you’ll wind your way through the bustling streets of Deira, feasting on everything from Egyptian-style “pizza” to saffron-infused ice cream from Iran. Arva’s passion for food is deliciously contagious, and we guarantee that no matter how many five-star hotel restaurants you dine at during your time in Dubai, none will be quite so memorable as the off-the-beaten-track gems you’ll discover on this food tour. Frying Pan Adventures Middle Eastern Food Pilgrimage, Dhs395 (Dhs350 June to September). Available year-round, select days of the week. More info on website. In any other city, the idea of a bus tour might make you roll your eyes. But in Dubai – which is not the most pedestrian-friendly of places – a bus tour is the perfect way to get your bearings, in air-conditioned comfort. Big Bus Dubai features three different routes: City Tour, which runs from Downtown Dubai all the way around Dubai Creek and into Old Dubai; Beach Tour, which takes you to Jumeirah Beach, letting you tick off attractions like the Burj Al Arab and the Souk Madinat; and Marina Tour, which covers Marina, JBR and the Palm Jumeirah. You can hop off at any of the 20 stops to explore at your own pace, or stay on for the whole ride. Our advice? Go for the two-day premium ticket. This city is spread out, so you’ll need the extra day to really do it justice. 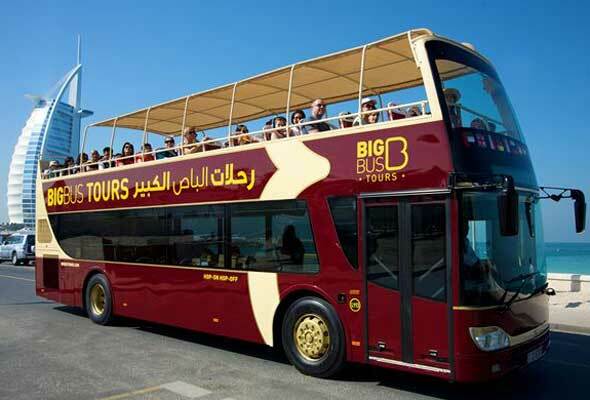 Big Bus Dubai Hop-On Hop-Off Tour, Premium ticket US$77 adult, US$49.50 child (via website). Available year-round, daily 8.50am to 7.30pm. More info on website. Want to check out Dubai Opera but don’t have time to make it to a show while you’re in town? Then book yourself in for a Dubai Opera Tour, where you can learn all about the iconic dhow-shaped building. Over the course of an hour, your guide will talk you through every architectural detail, and even give you a peek into the VIP hospitality suite, The Majlis. 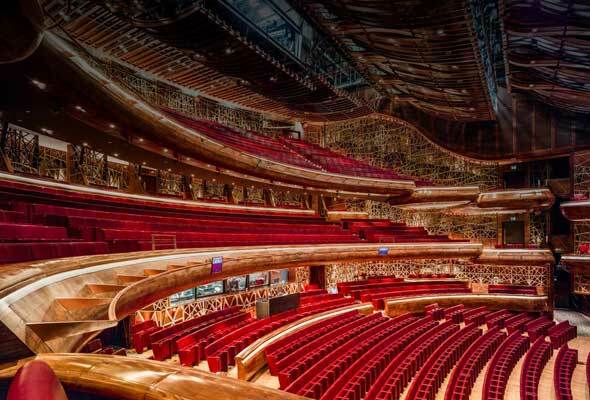 Dubai Opera also offers a backstage tour experience, once a month, which truly takes you behind the scenes. Dubai Opera, Dhs75 adult, Dhs45 children 3 to 16. Available most days. More info on website. A visit to this brilliant centre, located at the heart of Old Dubai, should be compulsory. With the motto ‘Open Doors, Open Minds’, its aim is to make sure every visitor walks away with a greater understanding of the traditions and customs of the UAE. One cool way it does this is by holding cultural meals, where you can sit down with Emirati hosts and enjoy a traditional meal. They also run a walking tour around Dubai Creek, which includes a visit to a stunning local mosque, Diwan Masjid, as well as tours of the iconic Jumeirah Mosque. Sheikh Mohammed Centre for Cultural Understanding, Al Fahidi Historical District, various times and prices. More info on website. Ok, so it’s not in Dubai, but most visitors do their best to fit in a trip to our neighbouring emirate to see the stunning Sheikh Zayed Grand Mosque. Our top tip? Arrive in time for one of the free guided tours. Not many people know about these, but they take place every day (check the schedule here). You’ll be led by an Emirati guide, who will talk you through the history of the mosque, its design, and Islam in general. 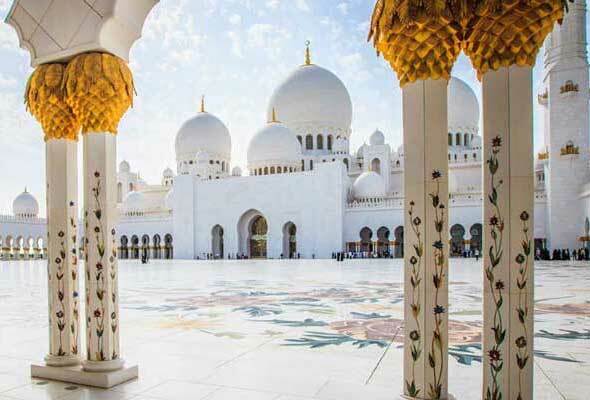 While Sheikh Zayed Mosque is spectacular in its own right, you’ll get a lot more out of the experience when you have an expert pointing out some of the special details you would have otherwise missed. It’s definitely worth planning your visit around. Sheikh Zayed Mosque, Abu Dhabi, free, available daily (walk-in). More info on website.